Love and forgiveness is always the right response. In our daily lives, all of us gather mental, emotional, and spiritual clutter. Others, as well as yourself, are capable of saying, doing, or behaving in ways that are less than helpful. Our words, actions, and attitudes in daily discourse impact one another more than you may at first realize. To our harm, we collect and hold in our memories and emotions disappointments or hurts that occur. With a little time, much of those common slights are soon disregarded. Those apparent slights we don’t dismiss easily, we gradually process and ultimately discard. At other times, feelings of misunderstanding or misjudgment may lodge in your psyche a longer than is profitable to your healthy well-being. Jesus’ advice is simple. Get over it. Here is the reality. You can neither control nor change what another person chooses to say or do. You, however, can choose what you say or do in return. For your own sake and the sake of the other, you must. Forgive and forget, in that order, is good counsel. One of two things happen when affronted; you will either react or respond. Those are similar but not near the same. Either can occur when you feel hurt. Reacting exacerbates a problem; responding offers reconciliation. When explaining this principle in counseling, I describe a person throwing a rubber ball against a wall. The ball reacts against the wall according to two relevant conditions – the force the ball is thrown and the hardness or softness of the wall. The initial force is at another’s initiative; you can neither control nor change that. The resulting absorption of that force is your decision alone. A natural reaction usually occurs in a force equal to or stronger than the initial action. A person angrily shouts at you; you naturally react by shouting back angrily, and thus it escalates. That’s how and when feelings get hurt and relationships are harmed, usually temporarily but sometimes permanently. A spiritual response absorbs another’s words or actions, giving back kindness for unkindness. As a boy, as I entered the house my Mom would remind me, “Allen, wipe your feet outside. I don’t want dirt on my clean floor.” She knew that I would otherwise be bringing into our home the dust, dirt, and little debris from where I had walked. Jesus’ counsel to His disciples was similar except he was talking about the stuff that gathers in our thoughts and feelings from our daily journey, “Shake the dust off of your feet when you leave that home or town . . let your peace return to you.” Read Matthew 10:11-14 NIV. 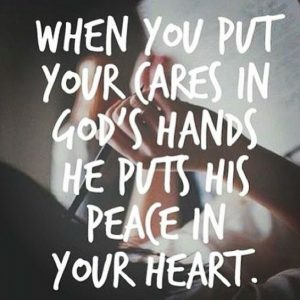 Don’t journey on without God’s peace, with which you came; don’t leave with hurts you did not bring. A Godly response is always better than a natural reaction. Love, understanding, and forgiveness is always the right response. In the Sermon on the Mount, Jesus was clear; “Pray for those who mistreat you . . Do to others as you would have them do to you . . Be merciful just as your Father is merciful.” Read Luke 6:27-38 NIV. Today, I pray for you to rest your cause in His capable hands. Your history is no impediment to God’s grace. Do you ever wish life was always easy? But life is not always that simple. Bad things happen to good people just like good things happen to bad people. Goodness never guarantees that all will be well for you at all times. Read 2 Corinthians 4:7-10 NIV. Contrary to what you may assume, “He makes His sun rise on the evil and on the good, and sends rain on the just and on the unjust.” Matthew 5:45-46 NKJV. God loves people; all kinds of people; people of all descriptions; people who do the right things; people who do the wrong things. Never confuse God’s love with God’s approval. We share a commonality of life experiences. That simple truth is evidenced when Paul wrote, “God demonstrates His own love toward us, in that while we were still sinners, Christ died for us.” Read Romans 5:6-8 NKJV. Still sinners, but a Savior died for us. Reflect on that when you struggle with the grace of God to those you deem undeserving. The best among us was never deserving of His amazing grace. There is good news. Your history is no impediment to God’s grace. Now let’s consider when bad things happen to good people. Don’t turn a moment into a monument. What things first appear is not what they will always remain. “For our light and momentary troubles are achieving for us an eternal glory that far outweighs them all.” Read 2 Corinthians 4:16-18 NIV. This might require a bit of faith from you. We usually assume that good things have good outcomes and bad things end with bad results. If we were to leave everything to chance, that would likely be true the majority of the time. Including God in the equation of daily life changes all assumptions. If Christians were trusting God while serving in the wicked Emperor’s palace, you can trust God where you are. See Philippians 4:22 NIV. The Apostle Paul encouraged those and other Christians in Rome, “And we know that in all things God works for the good of those who love Him, who have been called according to His purpose.” Romans 8:28 NIV. In all things, God works good. That is how God works. Emotions do not change the irrevocable truth of God’s Word. 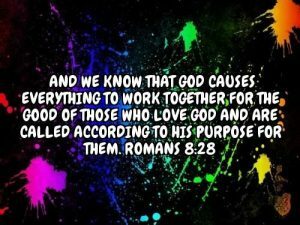 There are only two requisites for Romans 8:28 to be true in your life. First, you must truly love God, regardless of present considerations, and secondly, you must know assuredly that God has a purpose for your life now and always. Circumstances should neither change your love for God nor can they change His purpose for you. Today, I pray for you to be confident in God’s love whatever your circumstance. A humble heart receives a fresh release of His Spirit daily. “Be filled with the Spirit.” Ephesians 5:18 NIV. I have seen the picturesque, Dutch windmills in Holland that harnessed the wind’s power as early as the 14th century, and Texas windmills drawing water from wells on ranches far from the reach of electrical service, and the modern, towering wind turbines capturing the energy of prevailing winds converted to kinetic energy. What pictures of the power of the Holy Spirit breathing into and through a Christ-follower’s life. Are you trying to live everyday life in your own strength – to be what you should be by your resolve and determination, failing to understand life’s complexities and uncertainties by your limited knowledge and experiences, struggling to do all the things you should by your natural strength and ability? Is that working for you? Not too well I would imagine. Here’s some good news about all of that. You were never intended to live within those confining, self-imposed limits. Your best efforts fall short of success, due to inadequate resource, deficient knowledge, and lack of life-experience. God has provided the power you need to live joyfully and victoriously. Anything less than that leaves you drinking from an empty cup. You don’t need a little bit of God’s help; all God offers you will be required. You need to pray as Paul prayed, “I pray that out of His glorious riches He may strengthen (me) with power through His Spirit in (my) inner being, so that Christ may dwell in (my) heart through faith . . that (I) may be filled with all the fullness of God.” Ephesians 3:18 NIV. The fullness of the Holy Spirit is not optional; it is commanded. “Be filled with the Spirit!” Ephesians 5:18 NIV. And know this, God’s power cannot be stored up. Today’s strength will not stretch to cover tomorrow’s demands. The life of power you desire requires your bringing to God a sincere and humble heart to receive a fresh, daily release of His Spirit. The literal translation of today’s verse would more clearly be stated this way, “Be (being) filled with the Spirit,” denoting a progressive and continuous filling in the measure each day demands and your faith requires. Inner power is, “a work in progress,” every day. The word the Holy Spirit chose to describe this daily empowering is a picture of a sail boat with its sails intentionally set to harness the energy of the wind, and then moving responsively and powerfully under its sheer power alone. It describes the kinetic effect of a life responding to the wind of the Spirit, rather than the passive filling of some measure or volume. See Acts 1:8 NIV/John 7:37-39 NKJV. And what will be the visible and practical impact of being filled with the Spirit? Your life will evidence the character of Christ. “When the Holy Spirit controls your life, He will produce this kind of fruit in you: love, joy, peace, patience, kindness, goodness faithfulness, gentleness, and self-control . . if you are living now by the Spirit, follow the Spirit’s leading in every part of your life.” Galatians 5:22-23/25 NLT. The secret is simply allowing the Spirit’s control and following His leading obediently, every day and in every part of your life. Today, I pray for you to breathe deeply of the invigorating Spirit of God. An update for your continued prayer . . . Thank you for your concern, caring communications, and prayer. I am being treated for an inflamed nerve in my lower back that is aggravated by sitting for any length of time. That has impacted my ability to write EDL as consistently I would wish. My commitment to this ministry has not diminished. Our times together in God’s Word remain my joy. Thank you for your patience and continued love and prayers. Blessings, Allen Randolph. Let the best of your past be the boost for your future. “David chose five smooth stones from the stream.” 1 Samuel 17:40 NIV. 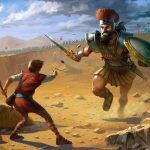 David and Goliath are a favorite story of mine. David achieved monumental success against all odds. Everyone likes a story where the good guy wins. Wouldn’t it be great if you could know and copy David’s secret? Success is not that simple. There is rarely just one solution. Almost as a footnote the Bible records, “David chose five smooth stones from the stream.” 1 Samuel 17:40 NIV. Ever curious about why David selected five stones? Without God, five ordinary stones are not all that more confidence building than one. The Bible does not answer that question, which allows us to consider why he might have done so. If you are serious about succeeding, I suggest you will be open to more than one way to achieve your goal. You need the kind of attitude that boldly says, “Whatever it takes!” Maybe David chose five stones because he didn’t know which one God would direct to its mark; he was just sure that God would make the most of his every effort. You can be sure of that as well. I suggest “five stones” as practical contributors to meaningful accomplishments. Learn from your failure; build on your success. Do not dwell on failures nor forget successes. Understanding those avoids further mistakes and celebrates victories as confidence boosters. People usually do just the opposite, recalling every painful, trivial detail of failure while discounting triumphs God helped them achieve. Let the best of your past be the boost for your future. David remembered well. “God who delivered me from the lion and the bear will deliver me from this Philistine.” 1 Samuel 17:37. Be careful; your focus determines your direction and expectation; make sure that moves you upward and onward. Paul practiced this: “I am focusing all my energies on this one thing: forgetting the past and looking forward to what lies ahead.” Philippians 3:13-14 NLT. Concern yourself more with God’s honor than your reputation. Like everything else in life, success is not about you and your enrichment or acclaim; your success brings glory to God’s Name and reveals His nature to bless Godly efforts. “I come to you in the Name of the Lord Almighty – the God of the armies of Israel whom you have defied. . the whole world will know there is a God in Israel. And everyone will know the Lord does not need weapons to rescue His people. It is His battle, not ours. The Lord will give you to us!” 1 Samuel 17:45-47. It’s not about you; it’s all about Him and His victory and glory. Success does not come to spectators. David was willing to join the battle. He was impassioned, “Who is this that he is allowed to defy the armies of the living God?. . Is there not a cause?” 1 Samuel 17:26/29. He became personally involved. Success does not come while you watch; success comes when you work. Never give up short of a Godly goal. I read this statement, “Success is 10% ability and good fortune, and 90% perseverance.” Someone else observed, “The harder I work the more fortunate I become.” Every success is built on a history of effort and perseverance. “In everything [David] did he had great success, because the Lord was with him.” 1 Samuel 18:14 NIV. Success awaits you. Today, I pray that you experience the satisfaction of good effort amid the joy of success. The fear of the Lord is recognizing that you are not God. “The fear of the Lord is the beginning of wisdom.” Proverbs 9:10 NKJV. There are times, things, situations, and people that warrant caution. Healthy fears can be lifesaving; most fears are unhealthy for you. Unhealthy fears are neurotic, destroying peace and stifling joy. Neurotic fear can be debilitating. Fear magnifies your imagination and distorts your perceived reality. Fear misdirects expectations to the lowest possible projection. A baby is born with only two fears: the fear of falling and loud noises. Others are learned along the way, unfortunately. Addressing and overcoming fear in constructive ways are important for emotional and physical well-being. The Bible has much wisdom to differentiate fears which are either hurtful or helpful. Solomon, whose greatest desire was wisdom (2 Chronicles 1:7-11 NKJV), learned where all wisdom begins. 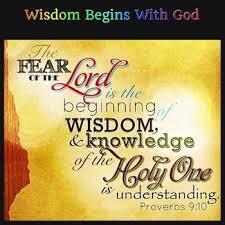 “The fear of the Lord is the beginning of wisdom, and the knowledge of the Holy One is understanding. For by [wisdom] your days will be multiplied, and years of life will be added to you.” Proverbs 9:10-11 NKJV. The Bible has much to say about “the fear of the Lord.” People wrongly equate it with other fears, which at their base have an inner concern of personal danger or harm. See Proverbs 29:25 NIV. The fear of the Lord is nothing like natural fears, except when misunderstood. Adam and Eve hid themselves from God then explained to Him, “We heard your voice and were afraid.” Genesis 3:10 NKJV. Their fear was a lack in their own character, not from a lack in God’s character. Gods’ response? He provided covering for their shame and promised them a Savior. How do you not love a God like that? I think many have a distorted an understanding of Godly fear. Incorrectly, a person who neither understands God’s holy nature and righteous character, nor is committed to the unvarying truth of Scripture’s revelation of God, may live under a false fear of what God may do to them. What you are capable of doing to God should be your fear – ignoring Him, disobeying Him, disbelieving Him, disappointing Him, or misrepresenting Him to others. You are more likely to “hurt God” by how you treat Him than He would ever harm you. I came upon a quote deserving reflection, “The fear of the Lord is the deeply sane recognition that we are not God.” To that, I would add, “. . and a holy recognition that He is.” Unhealthy fears are often the product of one’s ignorance of God’s existence or stubborn disbelieve in His caring and character. It helps if you understand what the Bible calls fear, as it relates to one’s relationship with God, is “the attitude of respect and reverential awe,” a sublimely positive affection rather than a negative emotion. The practical elements of the fear of the Lord and reverence are: a clear understanding of God’s nature, a pure obedience to God’s Word, and a clean heart in God’s presence. I love the Bible’s description that “the believers were walking in the fear of the Lord and in the comfort of the Holy Spirit.” Acts 9:31 NLT. The Spirit’s comfort seems proportional, if not dependent, upon your devotion to walking in the fear of the Lord. I desire to be one who values the righteous fear of the Lord because I do not want to ever be apart from the Spirit’s comfort. I trust that you examine and determine that you desire the same. Today, I pray for you to prize a holy reverence for God and His wisdom.